Salesforce chairman and CEO Marc Benioff knows a thing or two about how to put on a good show. As usual, he pulled out all the stops this week at Dreamforce, his company’s massive customer conference in San Francisco. This year there was a national park theme and there were signs everywhere that echoed the design of the iconic national park signs. The idea was that every participant was an explorer blazing trails. It was part of the gamification of the event to get people to visit as much stuff as possible. The event, built in its chairman’s image, included charity booths, a mindfulness booth staffed by French monks and a meditation room. 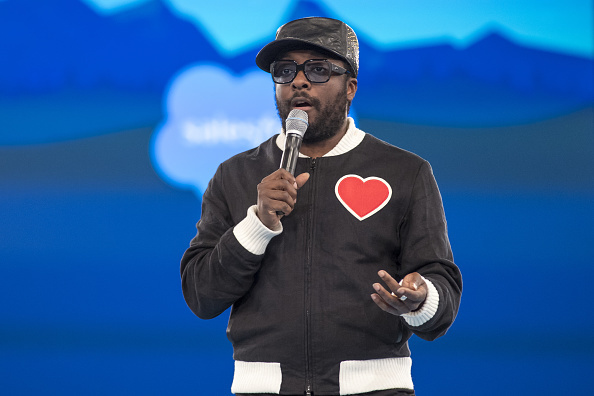 One of the special guests at the keynote was Will.I.Am. The conference party featured a performance by U2. Salesforce doesn’t do anything small. But in the end, when you take out the fake grass lawn, the cartoon Einstein that joined Benioff and co-founder Parker Harris on stage for the keynote — Einstein is part of Salesforce’s latest initiative involving artificial intelligence — and all of the smoke and mirrors, it was ultimately about entertaining and informing customers, and selling Salesforce as a visionary company. At a press conference on Thursday, company vice chairman, president and COO Keith Block talked about Salesforce’s ability to deliver new technology to the masses as a key strength of the company. “The message is embrace this technology. We believe we are uniquely qualified to deliver this technology,” he said. Perhaps the delivery part is a bit overstated, but certainly Salesforce seems to have a unique ability to introduce new tech, whether it’s the social enterprise, big data, the Internet of Things or artificial intelligence. Surely those of us who write about this stuff for a living have heard it all, but the folks who attend this conference probably only have a slight idea of what these concepts are about. Benioff and Salesforce talk about these ideas in ways that regular business users can understand. Artificial intelligence took center stage at this year’s Dreamforce, and it’s a challenge to explain these concepts to the masses. The fact is that Einstein, which was announced a couple of weeks before Dreamforce, isn’t actually a product. It’s a set of technologies that underly the Salesforce platform and add a level of intelligence to each of the products (or will over time). Perhaps because artificial intelligence is hard to explain, Salesforce decided to productize it in the form of Einstein. By giving it the name of a really smart person, maybe it drove home exactly how revolutionary this technology could be. Of course, in its current early guise, it’s not that earth-shattering, offering predictive lead scoring and opportunity insights, which alert a rep how a deal is trending. These are frankly a rudimentary beginning, but this is the typical approach for Salesforce. They get everyone revved up and thinking about these advanced concepts and they layer them onto the platform over time. The company philosophy involves staying on top of trends and introducing them early. Dreamforce included something for everyone, with 2,700 sessions running non-stop from 8:00 in the morning until late in the afternoon. Parties abounded at night and bars overflowed with raucous attendees. There were partner pavilions and hands-on demos. There was live music on a large stage in Dream Park. There were bean bag chairs, benches and hammocks scattered across the fake green lawn. It was, for all intents and purposes, a three-ring circus. To be fair, it wasn’t all business. Benioff continually touted charity and giving back to the community, and he seemed sincere about it. “You are at work, and you have great leadership skills. You can isolate yourselves and say I’m going to put those skills to use in a box at work, or you can say I’m going to have an integrated life. The way I look at the world, I’m going to put those skills to work to make the world a better place,” Benioff said at one point during the event. From a news perspective, not that much came out of the conference. The Salesforce-Twitter rumors persisted, although they diminished somewhat throughout the week. Salesforce did buy an adtech company, but most of the product news was announced well before the conference. The thing is that the conference wasn’t put on for the likes of me. 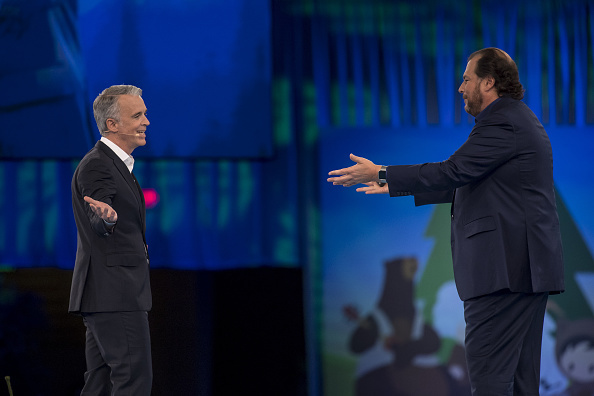 It was more about putting on a show for customers, while showing off the pure economic strength and vitality of Salesforce. And it was about dreaming of big things — and pageantry, showmanship and bread and circuses.